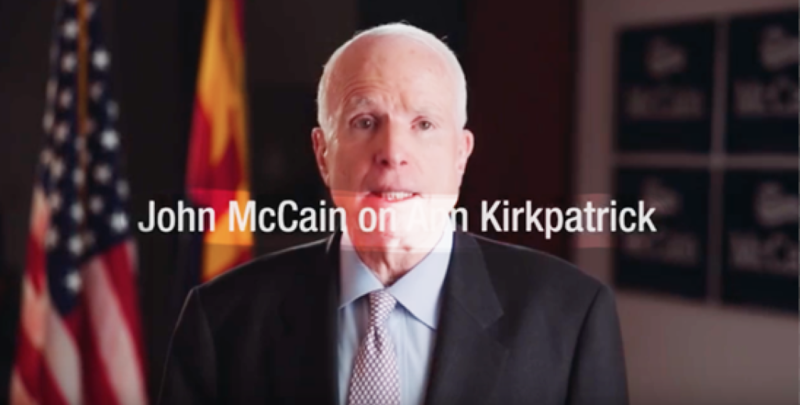 A new ad appearing on television Wednesay paid for by the National Republican Congressional Committee, is being criticized by John McCain’s family for using an old video to criticize former Congresswoman Ann Kirkpatrick. The 30-second video called “Warning” re-uses a campaign commercial from 2016 when Kirkpatrick – who at the time the Democratic nominee challenging McCain for his Senate seat. In the ad, McCain faults Kirkpatrick for not opposing tax increases and additional federal spending. Kirkpatrick, who is running to replace Congressional District 2 Rep. Martha McSally, said the NRCC was despicable for running the ad just slightly a week after McCain’s burial in an attempt to support her Republican rival, Lea Marquez Peterson.